This top quality cloth is suitable for snooker and English pool and can be supplied as cloth or fitted by one of our specialists. Hainsworth Smart Cloth is a fantastic and beautiful range of cloth recommended for English pool. 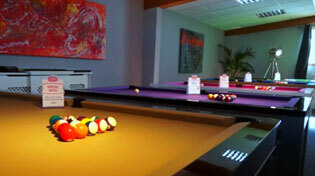 The Hainsworth Smart collection is suitable for both snooker and pool. A truly durable cloth, Smart cloth is both extremely hardwearing and independently tested for colour fastness and resistance to fading to B.S. EN 150 105 B02 1999 standards. Hainsworth Smart Cloth is a performance cloth which is fantastic for both value and longevity, and has a beautiful napped surface for smooth play. A range of more than 20 colours is available to suit almost any décor, and we can supply 6ft, 7ft and 8ft sizes. We can supply your new Hainsworth Smart Cloth in a set suitable for a bed and cushions, in which case you will need to arrange fitting yourself, or we can fit the cloth for you and take all the hassle out of the job. Simply select the "Fit to Existing Table" option when buying your cloth, and we will arrange to come to the table, fit the cloth to both bed and cushions, and leave you with a freshly re-covered table ready for the first of many games.